The Civil Aviation Authority (CAA) has given the go-ahead for the reclassification of the airspace over Belfast. The change, which comes into effect from 26 May 2016, will see all airspace within the Belfast Terminal Manoeuvring Area (TMA) change from a mix of Class E and D controlled airspace to solely Class D.
The newly simplified classification won’t affect commercial air traffic in and out of Belfast City or Belfast International airports, but will help ensure radio equipped private aircraft can still enter the airspace following permission from air traffic control. Non-radio equipped aircraft will still be able to access parts of the area under coordinated arrangements. The CAA’s approval follows a NATS consultation held last year. Airspace volumes can take several different forms, or ‘classes’, each with its own set of rules and procedures. 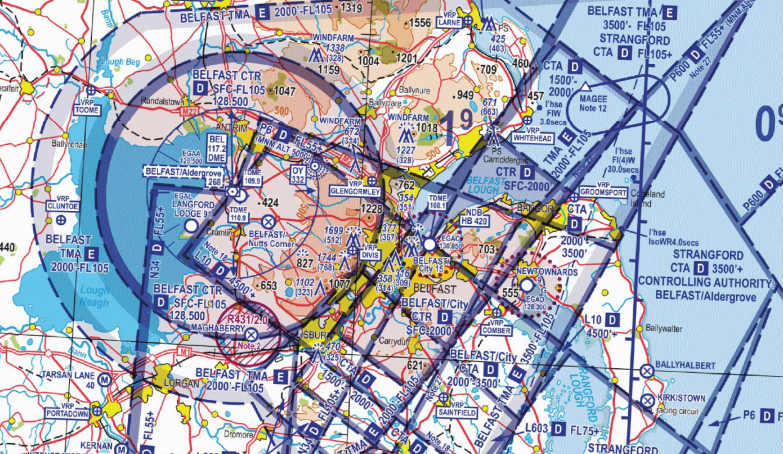 Airspace classes range from Class A, with the strongest restrictions, through to Class G.
Moving the Belfast TMA to Class D brings it into line with the classification used around most other UK airports.